Since reading about sweet potatoes being a “superfood” I have tried to come up with a creative way to get my mini-monsters to eat them without coating them in brown sugar. For some reason none of them are really convinced that potatoes are good in any form. I have no clue where they hail from because their daddy and I LOVE potatoes…in any form. But this is one recipe that they actually eat all the ingredients as long as they are mixed together and stuffed into a tortilla. 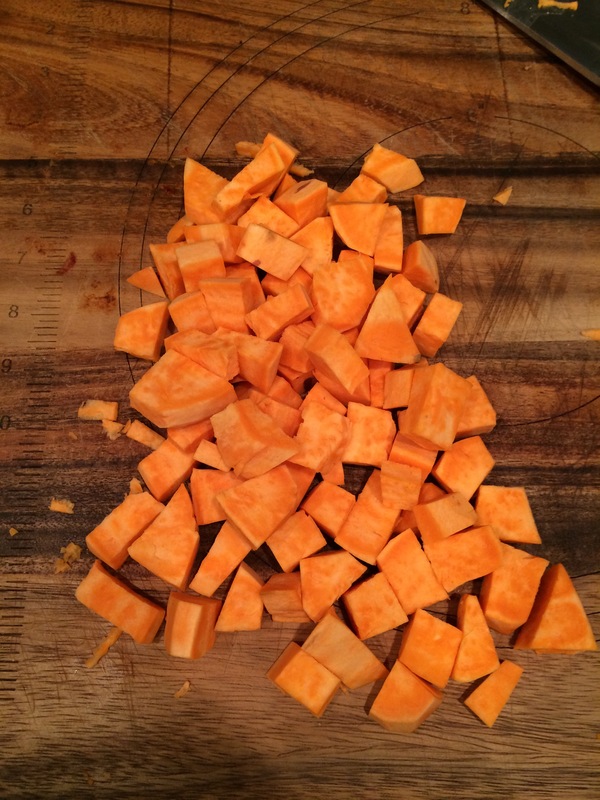 First I cut up the sweet potato. This is one large one cut up. One large one will feed all three of my minis. I throw them into a heated skillet on medium heat with a some olive oil until they start to brown and soften. While the potatoes are cooking I prepare the other ingredients. 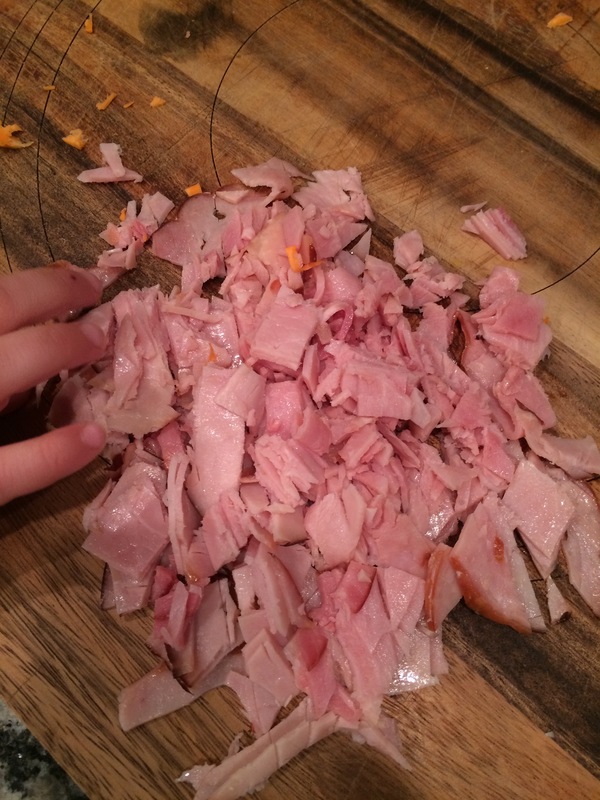 This is some chopped up sandwich ham. I also will cut up any vegetables in the fridge that might be starting to go bad. As you can see in the picture, my minis like to taste test everything. Next I whip up the eggs. This is a carton of 18 eggs because everyone in my family LOVES eggs…in any form. I whip them with a little sour cream. Helps make them fluffier. Once the potatoes are softened I turn down the skillet to a med-high heat and throw in the meat and veggies. Once they are cooked to liking I save the eggs for last since they cook quickly in a cast iron skillet. 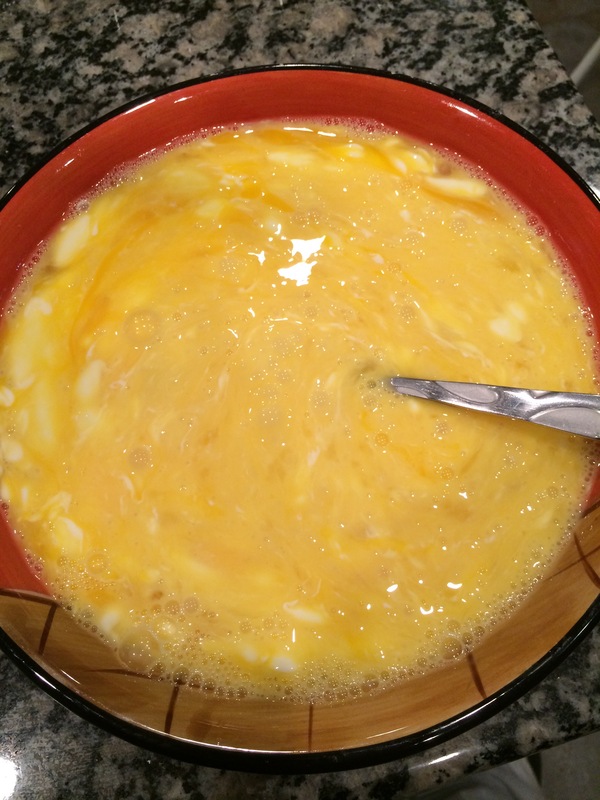 Stir until eggs are scrambled. I serve this either plain or on a tortilla with a little sour cream, cheese and fresh salsa which is optional. Kid tested and approved. YUM!! I love sweet potatoes! This sounds delicious!! It’s one of my new found faves! Thank you :)) it’s the one potato my minis will eat …I think because it has a hint of sweet. Thanks for the sour cream tip, never knew that. I love sour cream and creme fraiche! Another GF recipe; this week is a right bonanza of them! This looks great! I’m always looking for great skillet recipes especially while out camping. Oh I can’t wait to go camping!!! And yes my skillet will be in tow. One of these days I will just buy an extra one for the camper! Thanks for popping over and linking up with us! Thanks for stopping by and saying hello and of course for linking up to #foodpornthursdays! This sounds delicious. My children won’t eat eggs, but my husband and I love eggy things. 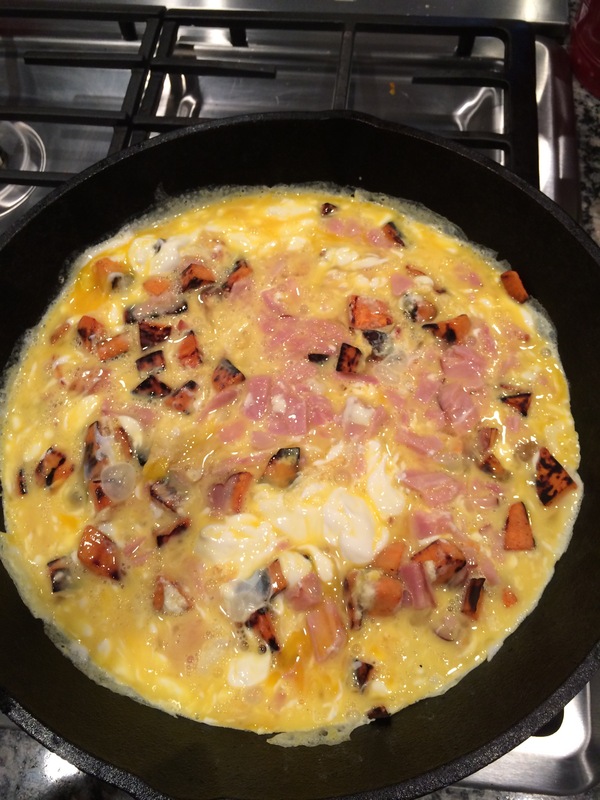 Love an omelette but not thought to use sweet potato. Really should use them more in my cooking. Will give this a go. They really cook up nicely in a cast iron skillet with a little olive oil. Yummy in my tummy as my minis say 😉 Thanks for popping over and saying hello and of course for linking up with us at #foodpornthursdays. 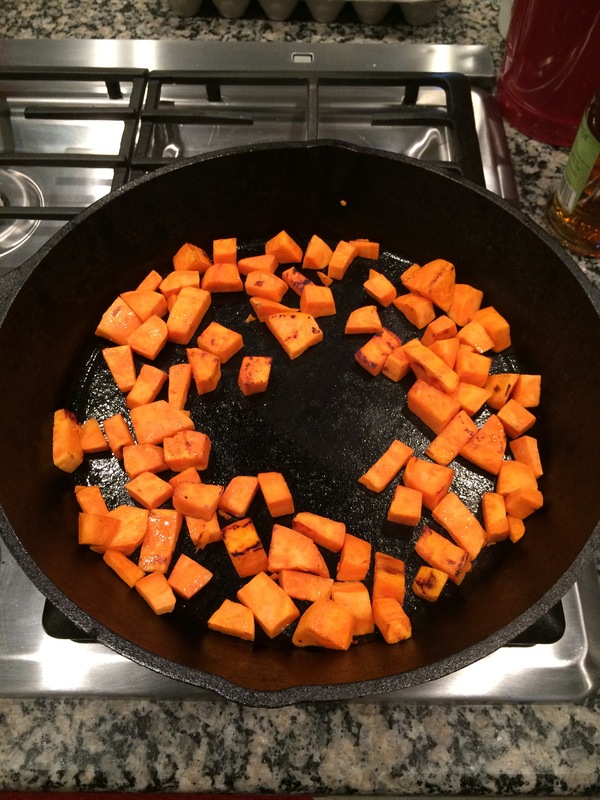 Love the look of this and the youngest and hubby are OBSESSED with sweet potatoes. Thank you for posting! #foodpornthursdays! Thanks for dropping by to say hello and comment. I love sweet potatoes in any form. So yummy! This looks like an easier version of a crustless quiche I make. It’s a great way to use up things in the fridge that need to be eaten. Thank you for sharing this. Now I have one more way to get everything used. That is always my main objective! I hate to waste anything! You can also cook it up and do the eggs over easy in the pan. I prefer it like that but my minis all like their eggs scrambled. Hey, they’re eating awesome, healthy foods so I’d say that’s a win! Thanks for stopping by and saying hello 🙂 Enjoy! I sometimes sprinkle them with some olive oil and brown sugar and just roast them in the oven. Yummy!